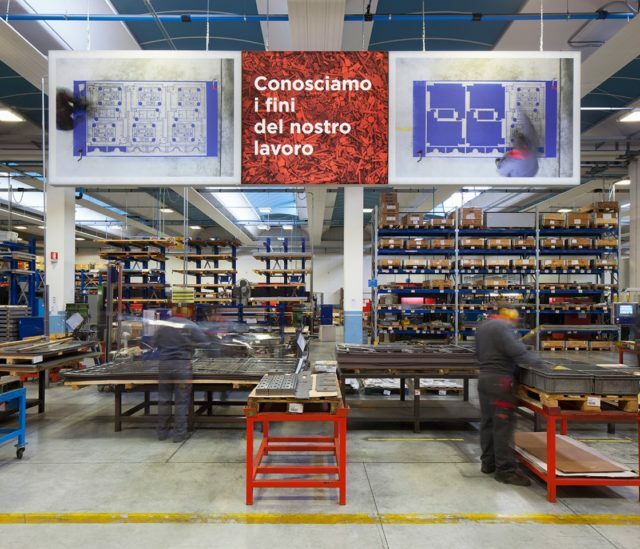 SUSEGANA, Treviso, Italy – Its employees call it “a small factory made of daring people”. 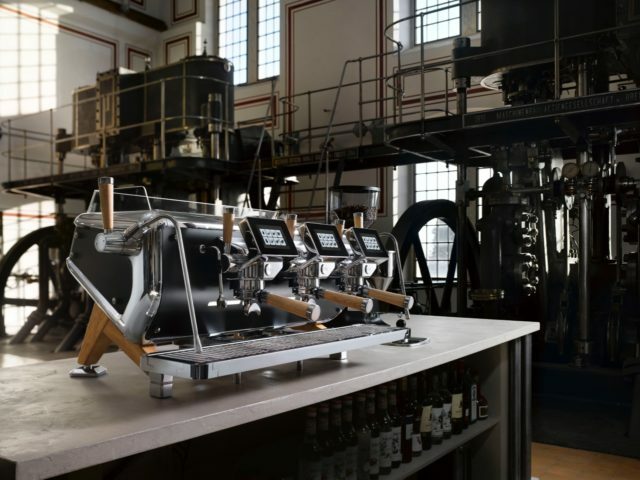 The facility that gives life to Astoria’s Storm is the world’s largest single-body factory where professional coffee machines are made. An exciting, intense and interesting visit to a facility that can hold a cathedral. It is located in the industrial area of Susegana, on Via Condotti Bardini. It is one of the four assembly lines in operation today. From the outside, it looks like an open house surrounded by wheat fields and hills of noble vineyards, which feeds on history, tenacity, determination and the distinctive attributes of people from the Veneto region. From the factory windows and open entry door you can admire bell towers, chestnut trees and the Castle of San Salvatore. These are not simply sentences thrown in there to describe the factory. Because in the middle of an assembly line, hanging from the ceiling, there is one of the many huge lightboxes that distinguish the facility. For this reason too, the factory stands apart from all others. In this sectors, as well as others. We have seen so many of them. A blue lightbox with huge photo. The mirror of the assembly line below, of the exact point where the lightbox is located, where details are assembled around the tank that you see already placed inside the steel frame. The writing is in large letters: A COMPANY, A LAND. There is also another point in the assembly line that features yet another photo: a professional machine during assembly. And another writing to ponder: “Let’s make coffee dream”. A phrase that refers to a clear impression that you can breathe inside the company. 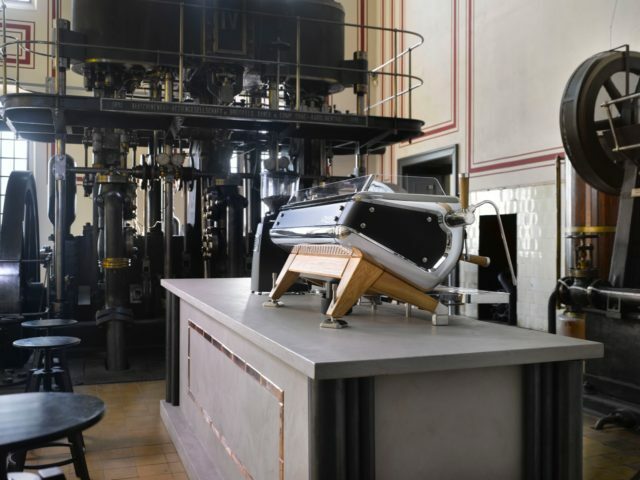 Attention shifts to another photograph, the historical image of the first coffee machine born in Susegana almost 50 years ago, the end result of intense days of work. To invent a future that is here now. Today, it only takes a few minutes along the assembly line to get the same result. Back then, 4 workers were leaning over a sober folded steel body, a single lever group. The unnamed model was placed around a wooden bench. Because history also applies to today. The logic of this facility remains to build in order to understand. Artisan knowledge combined with technology and deep personal responsibility, with a thought of the past relived today. Luckily, sometimes things that work do not change over time. 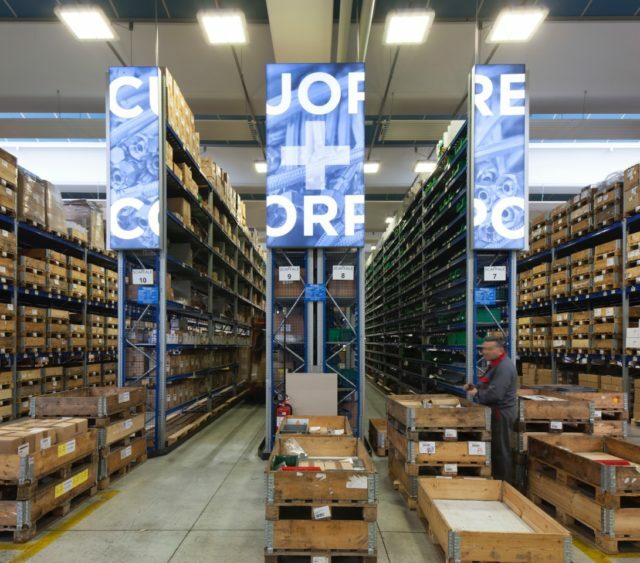 The section dedicated to technical assistance and the warehouse are located within four very modern production lines, well integrated with the corporate IT system. Outside, in the courtyard, and especially on Fridays, we find trucks waiting to load. Most of them bear foreign license plates. Yes, because over 90% of production is destined for markets all over the world. Just so nobody gets confused, place and destinations are prominently marked on large signs that adorn a huge wall of the factory. The signs bear words like Susegana, Veneto, Italy, and the World. Yes, because since 2012, Ryoma MC, the Italian holding Company that manages and coordinates corporate activities, has invested in the technological transformation of the facility. In almost six years, the Company never spared choices and technical investments that have always been considered one of the added values of this establishment. For this reason, during the visit you will be pointed to the many laser beams that read barcodes on the pallets to which machines are paired during assembly. Automated processing, computers and numerically controlled machines. In this way, it is easier to manage the features that each machine is required to have. Because all models of machines with features suitable for different markets and customers are assembled on the lines. What is striking is that in addition to its technological properties, Storm is a design object yielded by the contribution of the Adriano Design studio, which focuses on the needs of those who use the machine every day: baristas. Hence, the partnership with world champions of Latte Art and Coffee in Good Spirits of the last three years contained in the claim that accompanies Storm, “Barista Attitude”. The technological and technical universe of the Storm factory also includes numerically controlled machines that cut steel sheets with micrometric precision. And those that nearby produce a variety of metal parts that make up the frame and the Storm itself from similar sheets. To this end, the two cutting and molding departments work on two shifts to ensure that the voracious four assembly lines are adequately supplied. Since the assembly of metal parts built with great precision is considered the easy part of the process, we focused on the assembly of electrical and electronic wiring. Yes, because all cables, connectors, straps and very delicate electronic boards used for the controls are produced and delivered in real time with meticulous care and precision. To be sure, Storm, as Beppino Ceotto, one of the two Managing and Operation Directors, points out, is virtually manufactured at zero-kilometers. Because its pieces come from factories that are located near the plant, in the Veneto region. The farthest point is the nearby Lombardy region… and if, some pieces can indeed be made “from outside”, from further away, attention to detail and precision are no less significant. A great advantage both for supplies and quality control, which are continuous and seemingly maniacal along the whole assembly line and, in particular, in the very rigorous testing stations. There, it takes nothing to return a machine to the assembly line for remedial action, if issues are found. 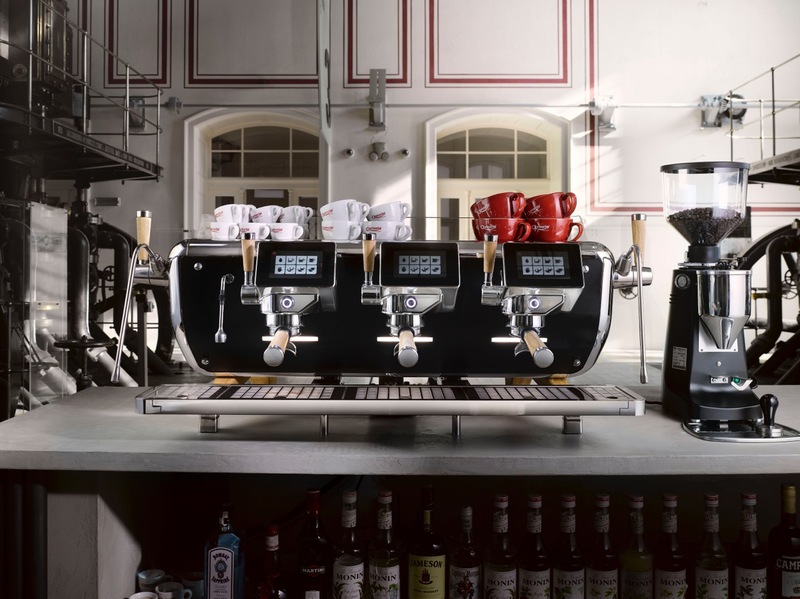 At the end of the visit, one gets the impression that this is indeed a vigorous Company which is giving a lot to the world of professional coffee machines. In essence, an opinion quite close to what we pointed out at the beginning: “A small factory made of daring people”. Otherwise, Storm would never have been born here.